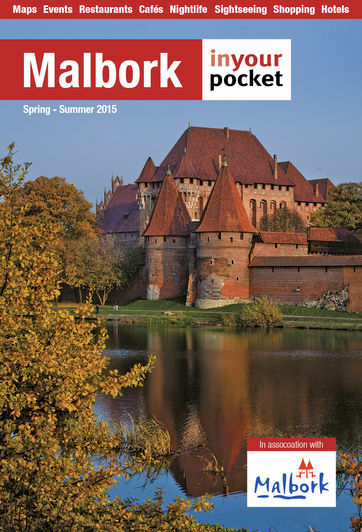 The history of the town of Malbork is inextricably connected to that of the castle it surrounds and its fortunes have risen and fallen with those of the castle. The Teutonic Order first founded a fort here in 1274 and named it Marienburg in honour of the Virgin Mary, their patron saint. The town grew up outside of its walls to the south and took the same name. Marienburg received a town charter in 1286 and in 1309 the Teutonic Order moved their headquarters here from Elbing (Elblag). The Knights and the city prospered helped by the tolls charged to shipping on the Vistula and other rivers through their network of castles and their control of the amber trade. The castle grew with several expansions in order to house the increasing number of knights and towards the end of the 14th century the Order’s Grand Master Winrich von Kniprode set about strengthening and developing the neighbouring town. Defensive walls were built with access to the town served via gatehouses on the south and east sides of the town and the town hall was built in 1380. The church of St. John and a series of covered arcades were also built. In 1410 the Teutonic Knights were defeated at the Battle of Grunwald but many made it back to the castle ahead of the pursuing Polish/Lithuanian army. What followed became known as the Siege of Marienburg and the two month stand-off saw the town outside the castle walls burnt (by the Knights incidentally to deprive their opponents of food and shelter). Although the Knights survived and the town and defences were rebuilt, the defeat at Grunwald marked the beginning of the end for the order. The Thirteen Year War (1454-1466) once again saw the town suffer serious damage and in 1457, the castle passed to the Polish king Kazimierz IV Jagiellonczyk after it was taken by Teutonic mercenaries in payment of debt and sold to the Poles. The end of the war saw the area now under the control of the Polish crown and re-christened Malbork, and this marked the beginning of a golden period for the town. Trade in Polish grain and timber and the development of local crafts brought prosperity and people began to settle in new districts beyond the medieval walls. What followed was close to 150 years of relative peace and prosperity which came to an abrupt end with the invasion by Swedish armies during to what is referred to locally as the Swedish Deluge. The city, like much of the Polish-Lithuanian Commonwealth was seriously damaged and looted and the Swedes occupied the castle and town from 1656 to 1660. The next 100 years saw the town with reduced economic importance but that changed with the First Partition of Poland which saw the area pass to Prussian control in 1772 when it was renamed Marienburg. Napoleon’s armies passed through the town on their march east and this brought the Cossacks to Marienburg in 1813 as they pursued his army back across Europe. Napoleon’s defeat saw the town return to Prussian control once again. The town developed rapidly from the mid 19th-century with the building of railways and industry. Among the companies to spring up were the Loeser & Wolf cigar factory, the Adolf Daum Malthouse, a gasworks and one of the largest sugar mills in the region. The defeat of Imperial Germany in 1918 saw Poland return to the map of Europe after 123 years but the residents of Marienburg voted overwhelmingly to stay in Germany in a plebiscite in 1920 and so joined the neighbouring province of East Prussia. East Prussia suffered more than most during the Great Depression and the rise of Hitler in 1933 saw his Nazi party win over 50% of the vote in Marienburg. Polish interests and intelligentsia suffered and the outbreak of WWII saw many rounded up and sent to concentration camps. The war proved extremely costly to Marienburg and nearly 80% of the old town was damaged as the Red Army besieged the city in early 1945. The remains of the Marienburg Task Force blew the bridges crossing the Nogat as they retreated on March 9, 1945 and within days Polish authorities had arrived to take over the town once again. Faced with near total devastation and floods of Polish refugees arriving from land ceded to the Soviet Union in the east, authorities set about rebuilding the city almost immediately. The few remains of the old town, with a couple of notable exceptions, were pulled down and the bricks used in the rebuilding of Warsaw and Gdansk. In their place were built functional buildings to accommodate the newly arriving population. The castle stood derelict for many years after the war and was only saved by the creation of the Malbork Castle Museum on January 1, 1961. The castle was added to the UNESCO World Heritage List in 1997 and in recent years the town has experienced a boom in development. Now a very popular tourist destination Malbork attracts more and more visitors everywhere which is seeing prosperity return and the town is once again an important hub in regional industry.